The Nick: Dirty Deep, Mark “Porkchop” Holder & MPH. 9 p.m. The Nick: Bassham, Sketch, Jibblës, Miguel Garrett #DJMiggySmallz, djcharles_iii. 10 p.m. Oasis: Michael Battito. 8 p.m.
Saturn: Bishop Briggs, Foreign Air. 8 p.m.
Tin Roof: Tyler Farr. 7:30 p.m.
Brennan’s: Jasper Coal, The Black Donnellys. 7 p.m. The Nick: 5 Stories, Burn the Harlot, All or Nothing Band. 10 p.m. Oasis: AJ Beavers, Taylor Hollingsworth. 8 p.m.
Saturn: The Front Bottoms, An Horse. 8 p.m.
Crestwood Tavern: Beck Hall. 8 p.m. The Firehouse: Night Terrors, Heel Turn, Two Time Crooks. 8 p.m. The Nick: InGhosts, Artica, Gears Under Atlas. 10 p.m. Oasis: Cash Back. 8 p.m.
Pub 261: Jake Gibson Band. 8 p.m.
Saturn: Human Beat, Burning Moon, Rollo. 9 p.m.
Superior Grill: The Gamble. 7 p.m.
Todd English: The Divines. 7 p.m.
Zydeco: Southern Avenue, Lamont Landers. 9 p.m.
Iron City: New York Bee Gees. 8 p.m.
Marty’s PM: Steel City Jug Slammers, Spearman Brewers. 11 p.m. 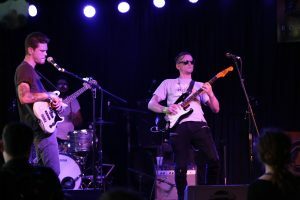 The Nick: Caddle, Chris Simmons Band, The Edmonds Butler Band, GreenLeaf Hustle. 10 p.m. Perfect Note: Phil Denny. 8 p.m.
Superior Grill: Sunset East. 7 p.m.
Tin Roof: Jerry Jacobs. 10 p.m. Trim Tab: Chelsey Whild. 9 p.m.
Avondale Brewing: CBDB. 11 a.m.
Daniel Day Gallery: Todd Simpson & Mojo Child. 2 p.m. The Firehouse: The Burning Peppermints, Holifields, Maja Dunes, Dream Culture. 8 p.m.
Ghost Train Brewing: Mr. B and the Tribal Hoose. 8 p.m.
Gip’s Place: Todd Simpson & Mojo Child. 8 p.m.
Innisfree: The Divines. 9 p.m. The Nick: Spirits Republic, Hotbed, Soviet Shiksa, Damned Rivers. 10 p.m.
Oak Hill Bar & Grill: Rick Carter. 9 p.m.
Saturn: Great Good Fine OK, KinZie. 9 p.m.
Saw’s Juke Joint: Blue Yonder. 8 p.m.
Tin Roof: Deputy 5. 10 p.m.
Zydeco: Daily Bread B2B Artifakts, Black Carl. 9:30 p.m.
Iron City: Fitz and the Tantrums, Mikky Ekko. 8 p.m. The Nick: Sleep Signals, 7 Stone Riot. 10 p.m.